Update (15 Jan 2018): Given that not a lot of information was posted here, I'm archiving this post and will not provide any updates here. Let's see if I can do a better job in 2018. Update (08 April 2017): Two new wedding and celebration stamps will be issued in a ceremony to be held at the Missouri Botanical Gardens in St. Louis on 02nd May 2017. USPS is organizing this event, which is free and open to attend. With this update, issue dates for only 5 of the previously announced stamps are pending. These are listed below. Update (28 Mar 2017): The Postal Service recently added two previously unannounced stamps for issuance in the second quarter. A new Global Forever non-denominated stamp will be dedicated in San Francisco, CA on 28th April. This stamp shows an image of echeveria, a succulent native to the Americas. The second stamp appears to be part of the Fruit-theme definitive series of stamps. It will be issued on 05th May in Acton, MA. This 3 cents stamp shows several strawberries, a white flower, leaves and bulbs from the strawberry plant. This stamp will be issued in coils of 10,000 only. Images for recent stamp dedication ceremonies can be found on the Better Philately twitter feed (click here to follow). Update (18 Mar 2017): Several stamps have been issued by USPS in February and March. Details for these stamp issues can be found in another blog post. 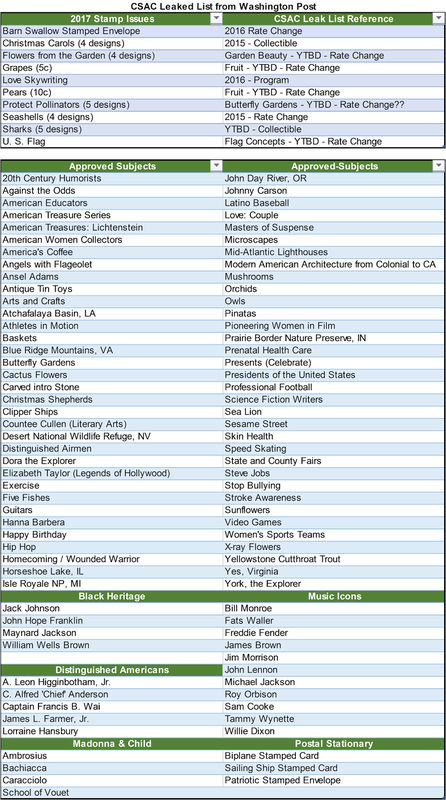 Dates for stamp releases in Q2/Q3 were recently provided by USPS to philately media and those are listed below. Update (22 Jan 2017): Two high denomination stamps should have been put for sale today, but were not to be found on USPS.com. Both, the Priority Mail and Priority Mail Express stamps were available for pre-order in panes of 4 each, last two weeks. These stamps should likely be available at the post offices and online tomorrow onward. No dedication ceremonies are planned for these two issues. First-class mail rates are going up 2 cents from 47 to 49 cents from today. Booklets panes of 20 will now cost $9.80 and increase of 40 cents from the previous $9.40 rate. The only other changes appear to be in the priority mail rates, which will be covered with the two new stamps. We've updated the details for January and February 2017 stamp issues in another blog post. Click here to check it out. As soon as more information on the issue dates or new subjects becomes available, we will share it here. While discussing new issues, it's worth noting that the CSAC stamp subject list that was leaked on Washington Post in 2014 still continues to provide enough hints about potential stamp issues. Many of the stamp subjects disclosed for issuance in 2017 were mentioned in some form on that list. Below are the subjects that were on the leaked list and the ones that remain as potential topics. Stamps issued over the past 3 years (2014-16) are not shown. Update (06 Jan 2017): The Post Office announced five new stamp subjects for issuance in 2017 on 28th December 2016. These are listed below. Issue dates for many of the Q1 2017 stamps were known as of 05th Jan 2017, covering about half of the stamp subjects announced by USPS so far. Two other make-up denominations under the Fruit definitive series were also announced. No dedication ceremonies are planned for the high denomination stamps on 22nd January. 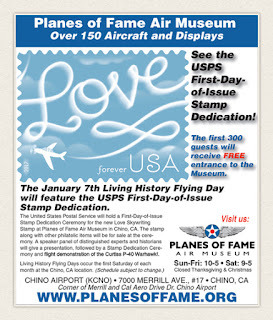 Dedication ceremonies for most other stamps are planned in places associated with the stamp subject or at stamp shows. The stamp on Oscar de la Renta will be issued during the New York Fashion Week, WPA Posters at Hyde Park and JFK stamp in Boston. Update (23 Dec 2016): Issue dates for two more stamps was provided in the latest Postal Bulletin by USPS. 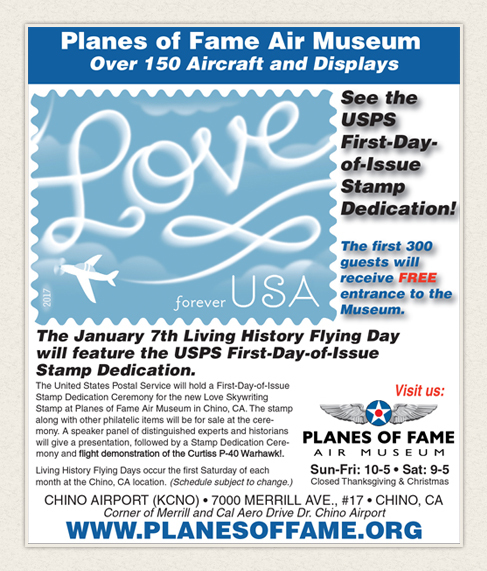 The U. S. Flag Forever stamp will be dedicated on 27th January at Norcross, GA during the Southeastern Stamp Expo. This stamp will be issued in booklets of 10, 18 and 20 as well as a Coil of 100 stamps. Both, BCA and Ashton Potter will print the booklets of 10 and 20 and the Coil stamps, but details for the ATM booklet pane were not yet available. The next day, on 28th Jan, the Postcard-rate stamp on Seashells will be issued in San Diego, CA likely during a stamp show as well. These stamps in 4 designs will be made available in panes of 20 and in coils of 100 stamps. Update (17 Dec 2016): A couple of other stamp issue dates have become available. The stamp on Dorothy Height will be issued on 01st February in Washington, DC. 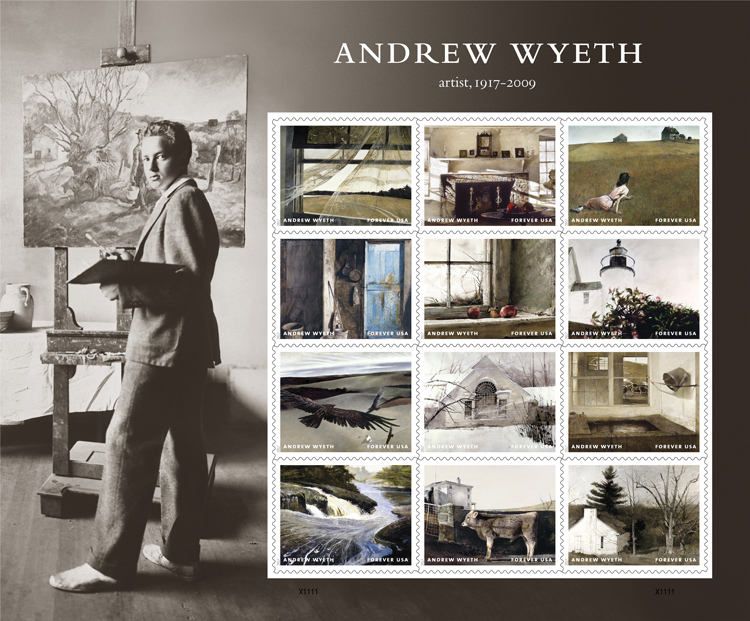 Release dates for Andrew Wyeth and Father Ted Hesburgh stamps are now known as well. 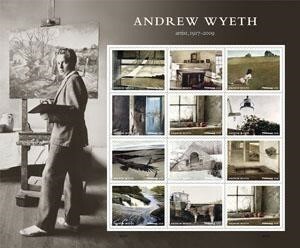 The pane of 12 stamps on Andrew Wyeth will be dedicated at the Brandywine River Museum of Art, PA on 12th July, as reported on ARTFIXdaily. United States Postal Service also revised the design because one of the stamps (bottom right) was repeated twice in the original art work shared on 22nd November. See the original and the revised designs below. Issue date for Fr. Hesburgh was announced on Notre Dame's Facebook page and via a press release. Update (10 Dec 2016:): Issue dates for the first two stamps have been announced in the latest Postal Bulletin. See the dates below. 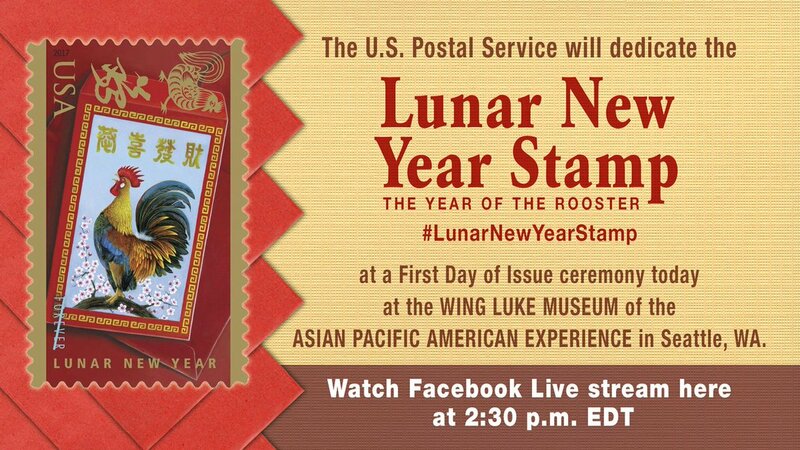 The Lunar New Year stamp will be issued at the Wing Luke Museum of Asian Pacific American Experience in Seattle, WA and the Love Skywriting stamp will be issued at the Planes of Fame Air Museum in Chino, CA. Update (22 Nov 2016): Additional stamp subjects were announced by USPS today. With this update the Postal Service has revealed 26 stamp subjects with a total of 78 stamp designs. Original Post (02 Oct 2016): The following stamp subjects and associated images have been announced by the Postal Service. This information was made available in the public domain via a press release on 20 Sep 2016. This blog post will be used to provide updates and other information for our readers for all stamp subjects for 2017. Another blog post will list the stamp issues once all the relevant information for printing and designs are available. Do continue to follow both the posts regularly once the new year begins. Until then, enjoy the upcoming holiday season and keep collecting. It appears that the Flowers of the Garden, Delicosio and WPA Posters could be issued at 'booklet' panes of 20, Uncle Sam's Hat, Seashells and U. S. Flag could come in rolls and others appear to be issued as panes of 20, except for the Lunar New Year stamp.